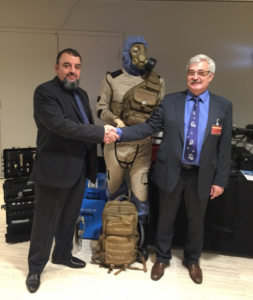 International CBRNE Institute – Training Center of Hotzone Solutions Group (HZS), a Hazardous Substances Management Solutions and CBRNE training provided company, was present at the 22nd Conference of State Parties of the OPCW 2017, held in The Hague, from 27th November to 1st of December 2017. 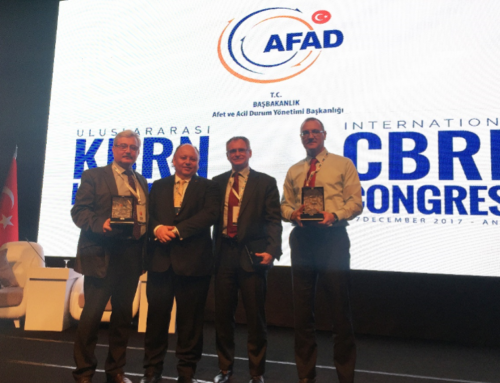 It was the fourth time that International CBRNE Institute (ICI), was taken part of the CSPs of the OPCW within Chemical Weapons Convention Coalition (CWCC) under leadership of Green Cross International (GCI). Side events arranged by GCI were included exhibitions opportunity for NGOs participated in the 22nd CSPs. HZS Group using the ICI platform exhibited their products and services to participants of the CSPs. Hotzone Solutions Group products were introduced to the high-level States Parties representatives at the Conference. 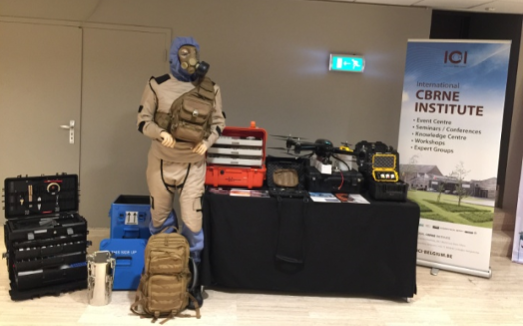 Five busy days at our stand the OPCW community showed great interest in the new range of innovative products for CBRNE demonstrated by ICI/HZS at this CSPs. Exibited were personal protection equipment integrated with Fragmentation Protection System, compact Raman Spectrometer with unique database (CWAs, its precursors and degradation products, TICs, narcotics and explosives), Field CBR Sampling kit, new Hotzone Identifier Explosives kit, Hotzone Identifier HazCat kit, CWAs stimulants kit, Samples Transport Containers and prototype of HZS Aerial Chemical and Radiation Survey and Sampling Integrated System, a UAV mounted gamma and chemical detectors for aerial reconnaissance and radiation mapping and sampling. Full catalog of Hotzone CBRNE products was available at the ICI stand as well. 136 States Parties participated in the Twenty-Second Session of CSPs of the OPCW. 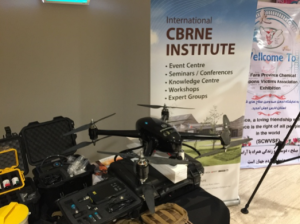 Majority of the representatives have visited of the ICI/HZS stand and expressed big interest to the HZS CBRNE products, live agent CBR training services and other services provided by ICI and HZS. Representatives (Ambassadors and Technical Advisors) from North and Central Africa, Mid East, South East Asia and South America have expressed their wish to cooperate with ICI/HZS in live agent training and to purchase CBRNE equipment. All visitors to the stand were very interested to know great details the new range of HZS innovative products for CBRNE defense and environment protection which were presented at HZS Product Catalog, such as: the Invasive Technologies Monica & Midas Systems for remote case entry for sampling and disposal of CBW agents and toxic substances; the Sea Based Radiation Early Warning System to warn and protect the population from radiation hazards; the Hotzone Responder DAL, a self-sustained deployable analytical laboratory for CBRE threat agents, environmental pollution assessment and response to major industrial accidents the ; and the Plasma Mobile Hazardous Material Treatment Unit for hazardous waste treatment. Some products were also discussed with representatives of Russian and Chinese delegations. HZS Senior Consultant/Special projects Dr.Yaugen Ryzhykau welcomed the visit of Dr Abdulrahman Abuoghuffa Head of National Authority, Libyan National Authority.